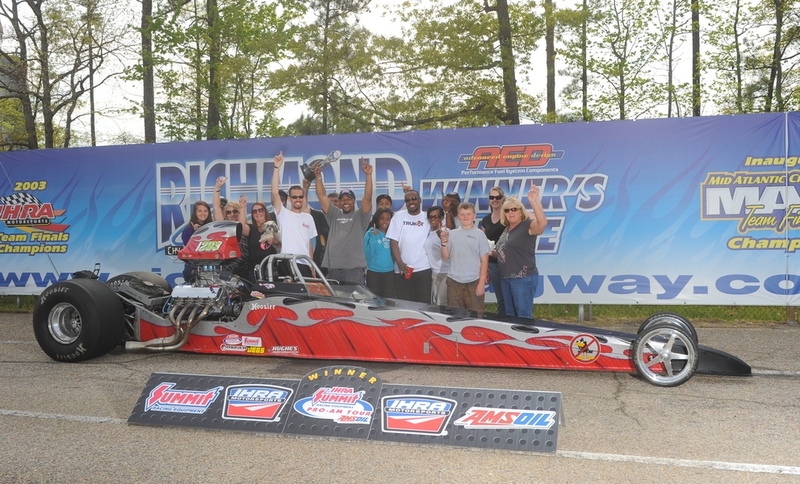 Richmond, VA - IHRA’s Division 1 has always been known as the place where champions race. While other divisions boast bigger fields and claim more competitiveness, the reality is that one of the biggest clusters of IHRA World Champions lies right in the heart of the Patriots Division. 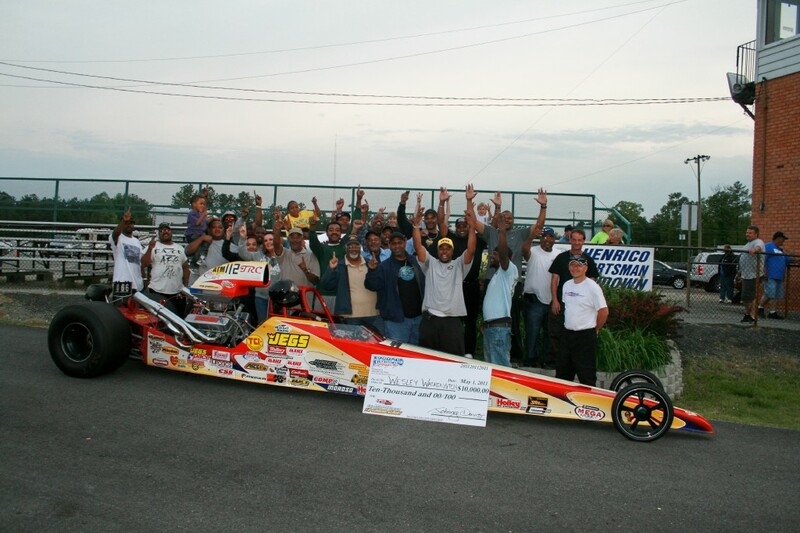 And at Richmond Dragway, those champions showed their stuff. 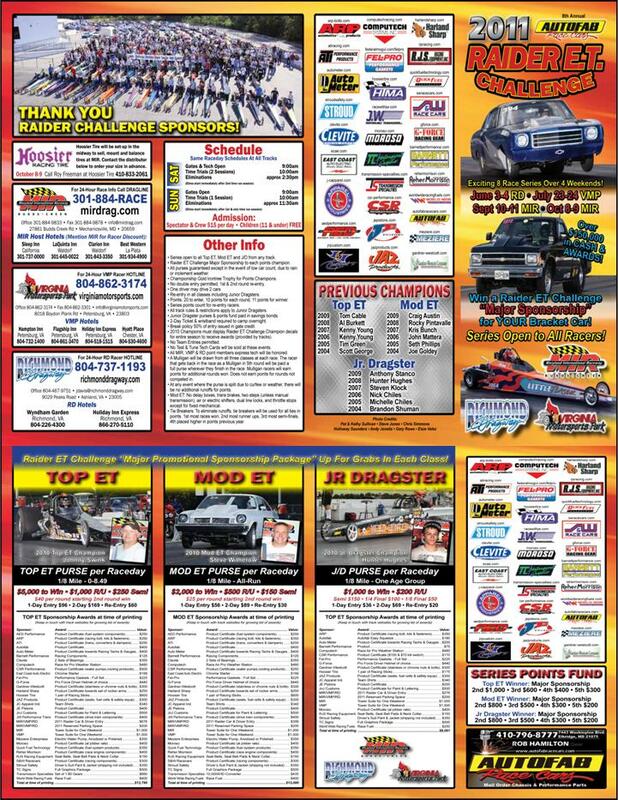 Sandston, VA - Two big days of Big Bucks Bracket Racing returns to Richmond Dragway this Saturday and Sunday with the Collison-One.com 10 Grand Slam. 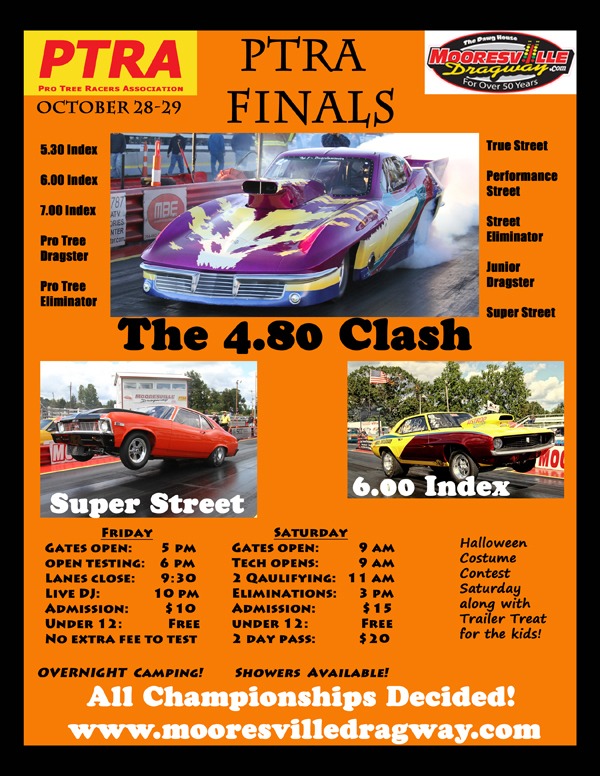 A low $200 entry fee for the weekend and dragsters vs. doorcars for the first 3 rounds. Friday night parking from 5-10pm. Gallatin, TN - This week's Holiday Races kick off into great racing starting July 6th. 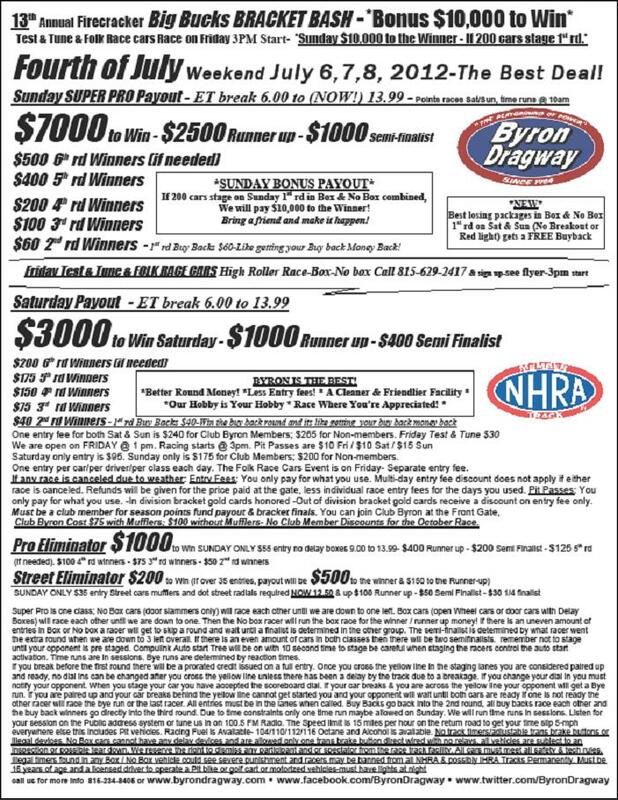 DTS Heads up at Milan, Dixie House 50k at Memphis, 10 Grand Slam at Richmond and the Firecracker Big Bucks in Byron, Illinois offer great Big Bucks racing options. Sandston, VA - Richmond Dragway will host their first of two 10 Grand Slam races of the year presented by Collision-One.com this weekend. $200 entry fee for the weekend gives electronics racers a shot at two $10,000 to win main events. First 3 rounds sees dragsters and doorcars separated. 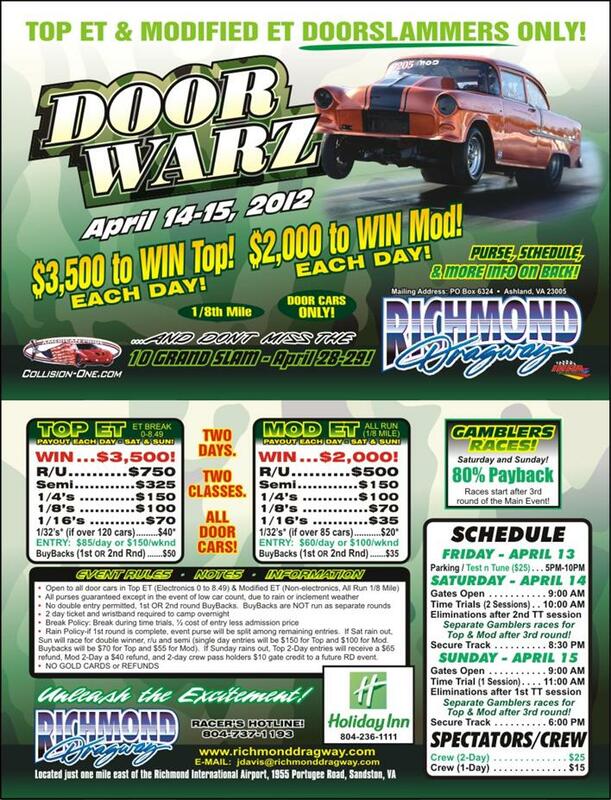 Sandston, VA - Doorslammers only this weekend at Richmond Dragway, when they host their Door Warz 2012 on Saturday and Sunday. $3500 to win in Top E.T. and $2000 to win in Mod E.T. each day. Friday there will be a test-n-tune along with parking from 5-10 pm. Gallatin, TN - Big Bucks Bracket Races will be contested as race tracks all accross the country this weekend. Mooresville Dragway, Montgomery Motorsports Park, Richmond Dragway, Prescott Raceway and Memphis International will be celebrating Halloween with featured races. 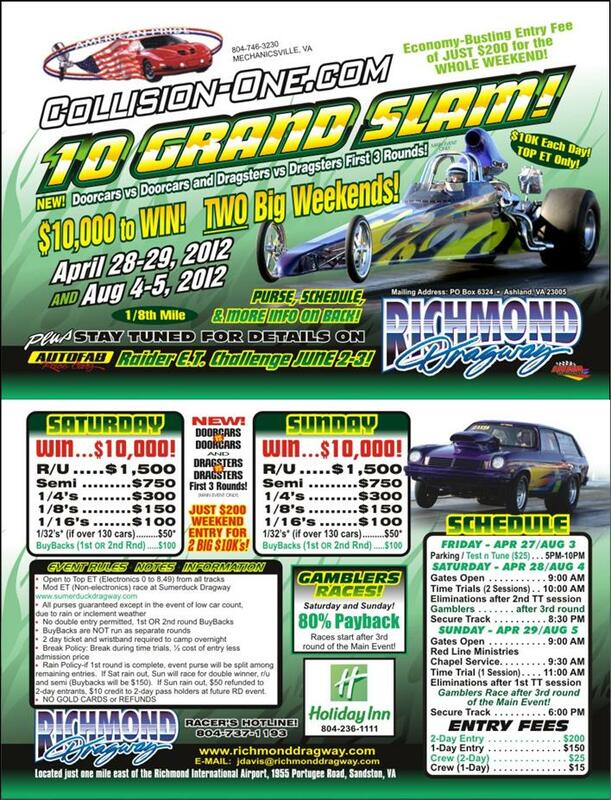 Mechanicsville, VA - Richmond Dragway will host the Collison-One 10 Grand Slam on August 6th and 7th. $200 entry fee for two $10,000 to win Big Buck Bracket Races. Parking will be open from 5-10 pm on Friday night for parking with gates opening at 10 am Saturday. Richmond, VA - Autofab Race Cars presents the first of 3 events in the Raider E.T. 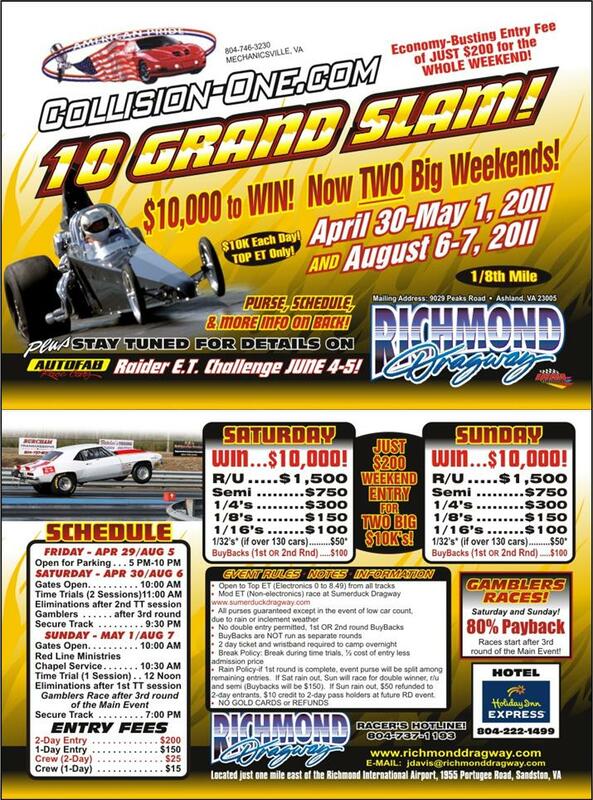 Challenge Series beginning at Richmond Dragway on June 3rd and 4th. This series was designed with the sportsman drag racer in mind, with low entrys, a strong payout and contingency awards. Sandston, VA - Scotty Bodmer and Wesley Washington each took huge wins April 30th and May 1st cracking the back for $10,000 wins at Richmond Dragway during the 2nd annual Collision One Paint and Autobody $10,000 Grand Slam.